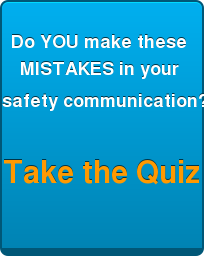 To ensure that your workplace safety communication is engaging, you need to have a stand out safety slogan. When choosing or designing your safety slogan, there are a few things you need to consider, to make sure your safety slogan is memorable. 1. Make it positive - Avoid creating a slogan that focuses on behaviour that you don't want. Instead, write a safety message that conveys what you want people to do. For example a negative slogan for height safety is "Don't fall for it". Using more positive language, a more appropriate version is "A harness is better than a hearse". While this might have negative connotations, it still focuses on what you want the person to do, rather than the wrong behaviour. 2. Keep it short (and tweet) - In this age of Twitter, being able to write in 140 characters or less helps you to distill your message. It's the same with writing a safety message, just try and encapsulate it in 8 words or less. Avoid long and complicated safety messages like "Don’t Fall Asleep At Work and Get Your Head Caught In a Splicing Bar" (too long, negative and not even funny) and "Mine Eyes Have Seen The Gory Of The Coming Of The Blood, It Is Pouring Down My Forearm In A Bright Red Crimson Flood" (is that really even a safety slogan? Seems more like an emo love poem). 3. Avoid jargon - Make sure the sentence flows easily. Avoid acronyms and words that not everyone will understand (see emo love poem above). To check that your slogan is easy to understand, ask yourself: "will my mum get this one?". 4. Contain a surprise - Common sense is the enemy of sticky safety messages. When our brain's guessing machine fails, it wants to work out why it was unable to guess. This surprise grabs our attention, so that we can be prepared in the future. By trying to work out what went wrong, our brain is more likely to remember the information. Here's a good example (a personal fave): Hug your kids at home, but belt them in the car. Slogans that contain the obvious will be ignored. Examples are: "Play it safe" and "Be aware, take care". Yawn! 5. Play on words - A clever play on words helps to make your safety message just that little bit more memorable. This can include rhyming and repeating words in a different order. Adding a little bit of fun can make a serious subject more approachable. Personally, the funnier the better, in my opinion. Ten fingers, Ten toes, if you are not careful then, who knows? Housekeeping you skip may cause a fall or slip. Make it your mission, not to live in unsafe condition. Safety fits like a glove; Try one on. Safety Shoes To House Your Toes; Safety Glasses on Your Nose. Make sure you use a safety slogan that links well with your safety campaign. Once you've chosen your safety slogan, use it a lot. 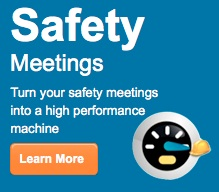 Put it in email newsletters, posters, stickers, training, safety conversations and use it in your safety meetings. Ideally, it's almost like a company "in joke" where people use it and giggle together. And don't make the mistake that just because you have a safety slogan, that's enough. 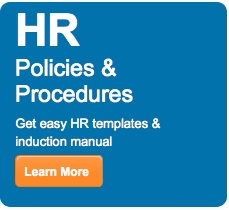 It's really important that you keep changing how you use it, so employees don't get fatigued by the message. 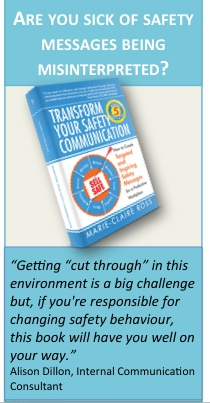 A good resource to provide you with lots of ideas about your safety communication can be found in the book Transform Your Safety Communication. 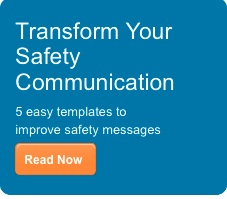 This highly acclaimed book provides 5 easy to use templates and frameworks to easily update your safety communication. Download a free sample chapter. Have you got any favourite safety slogans?